These sturdy figures hold guest towels or candy canes. Easy to make from 1/4" and 3/4" stock. Height ranges from 16"-21"H. Plan contains patterns for both Santa and snowman projects pictured. All patterns drawn FULL SIZE. Order hardware package separately. 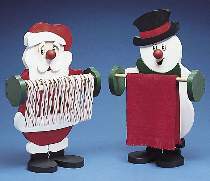 #1212 Holiday Towel Holder Hardware contains two pair of eyes, two wood ball noses and two pieces 1/2" dia. wood dowel - enough hardware to make one pair of Towel Holders. Project plan, remaining wood and paint not included. This #5049 Special includes the plan and hardware to make both the Santa and snowman. Only $8.19!